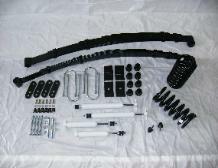 On this page you will find most of the parts needed to bring your GM F-body to modern handling level. GT: Is defined as a mild competition type of suspension that is on par with the 4th gen F-body suspension. COMP: Is for the more serious driver that wants the most from his car's abilities, great for a track day car. 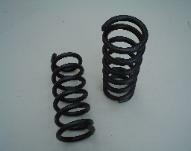 most coils will lower the car 1-2 inches without cutting. PLEASE CONTACT US FOR ADVICE AND PURCHASE . Comp Kit™ 2CS-430 2CS-435 $799.00 w spherical bearing. 70-81 Comp kit™ 2CS-432 $699.00 w/spherical bearing. 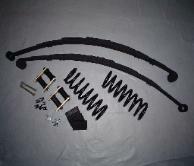 Featuring PTFB's Torktrax leaf springs. We also have kit for 67-69 F-body as well as 64-72 A-body, call or email us. truths, FACT, our solid 1.250 front sway bar IS stiffer than any 1.375 hollow bar and will not break at the ends! Our rear ADJUSTABLE rear sway bar mounts to the engineered mounting points not you floor's sheet metal that will rip away! 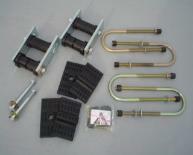 Our industry exclusive adjustable front sway bar gives you the most in suspension tunning. your sway bar or to install a rear bar on cars not originally equipped from the factory. Heavy duty tie down leaf spring plates. Made from laser cut 1/4" steel, No more bent leaf spring plates. Slotted for 1/2" U-bolts, Fits 3" to 31/4" axle tube. Tie down loops to make it easy to tie your car down on a trailer. 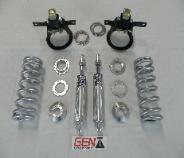 adjustment without running the risk of over extending or bottoming out the shock as hybrid kits do. Comes with weld on brackets and Viking double adjustable Warrior coil overs and choice of spring rate. tires harder on acceleration, they are made of CNC cut 3/16" thick steel, shot peened and powder coated. These PTFB brackets also have a unique feature moving the leaf spring inboard to provide more clearance to the tire.